Archanna Das, 39, has been heading ASCENT Foundation, a not-for-profit organization, for the past 2 years. It provides growth ready entrepreneurs with a peer learning platform which enables them to scale-up and enrich their entrepreneurial journey. She works and interacts with Thought Leaders, Domain Experts and Innovative Entrepreneurs like Harsh Mariwala, Ronnie Screwvala, Naina Lal Kidwai, Sasha Mirchandani and Vijay Shekhar Sharma. 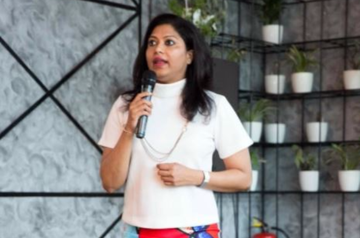 “I am passionate, self-driven, fearless and unapologetic about my life choices.” Here, she has shared her journey at work with us - how she achieved unprecedented and unmatched success at work. It’s been 2 years since I have been heading ASCENT Foundation, and the accomplishments here are so many. From scaling up member numbers to creating large format signature events, I have kept myself engaged at all times to shape my own insights and personality. When you’re working daily with entrepreneurs from such diverse businesses, every day is a new learning experience! Courtesy of my army background, I have studied in about 6 schools in different cities and towns around the country in 12 years. That gave me a whole lot of exposure to embrace changes and survive. However, what I always sought from life was not just mere survival; I have always hungered to triumph in whatever I pursue. From childhood, I was ambitious and raring to go. However, this is easier said than done- especially in a corporate environment. In my 14 years of work experience, I have moved and scaled varied profiles and in different industries. All this gives me the edge to handle diversity and yet be inclusive. My first job, even before I finished my last semester of MBA was with the Sales and Marketing department in Faber-Castell, a German stationery company. That was also the first time; I was moving away from family and settling into a new city. From MBA to being on the road selling stationery to retail, it was an eye-opening experience. I learnt the art of chasing targets and achieving them- being grounded and passionate. Next role was with an Indian company called GTL Limited of handling “Corporate Communications”. This is where I developed my understanding of communications and discovered how to implement it at ground level. I moved from here to HSBC and handled “Corporate Sustainability”. Eight years in HSBC opened a whole new world beyond just business and economics. Now, it’s been two years since I have been heading the Ascent Foundation. I always go beyond what is expected out of me, challenge my own self, get out of my comfort zone and make a meaningful impact. These are my biggest strengths and core reasons for where I am today. The biggest challenge was to work in large organisations and not get the growth as fast vis-a-vis a colleague from a pedigree B School. This was frustrating since employees are told that they get “equal opportunities”. This is not true. In fact, when I moved from an Indian company to an MNC, I was told by the HR of the company that as I was leaving them, I was making a big mistake. And that I will never be able to grow in my career at an MNC because of lack of a supposed pedigree education. Well, I proved them wrong. That truly didn't happen to me, because my greatest strength has always been being “fearless” and “grabbing every opportunity”. Of course, I made mistakes. However, I was good at finding where my foothold lies. Rather than letting sadness and anger overpower me, I learnt from it and moved on. That helped me achieve unparalleled growth in my career. Pursuing a career in the Corporate Sustainability space, I got to work on great projects which triggered so many blind spots in my own outlook towards work and life. I found solace in my contribution to some grass root work done with marginalized children from Rann of Kutch. The children came directly to me and communicated to me just how positively their lives had changed. This was a really satisfying moment of victory for me because the appreciation was not just coming from my boss. It was from people who had no vested interest in me as an individual and who genuinely were thankful for the meaningful impact they found in their own lives. Stop listening to people who say, “You do not have it in you”. We all have superpowers and a superwoman within, it is for us to find it and unleash it upon the world. Not to prove a point, but to actually contribute. Hi Piyali, I want to become an entrepreneur . I am an engineer. I have land in my village. I want to do something for poor village women . Can you help me? I volunteer with Vidya NIOS once a week. I am looking to do more from home. My son is 14 years and he returns from school by 3:30pm approx. I have to be around. Hi Piyali! I liked your journey! Are you based in Gurgaon? Is there a way for me to contribute from home? This #WomanInTech Is Acing The Game Even Without Being A Techie!